With very little coverage (Day 1: Irish Times here and here | RTÉ; Day 2: Irish Times), a case which had the capacity to make a fundamental change to Irish defamation law was decided in the Supreme Court at the end of last week. Two members of the Birmingham Six have taken defamation proceedings against leading English human rights barrister Sir Louis Blom–Cooper QC (pictured left). Blom-Cooper sought to have the case struck out on the basis that his expression of opinion was constitutionally protected. However, the Supreme Court allowed the case to proceed, and (if the press reports are accurate) ducked the constitutional question, at least for the time being. … one golden thread is always to be seen that it is the duty of the prosecution to prove the prisoner’s guilt … If, at the end of and on the whole of the case, there is a reasonable doubt, created by the evidence given by either the prosecution or the prisoner, as to whether the prisoner killed the deceased with a malicious intention, the prosecution has not made out the case and the prisoner is entitled to an acquittal. No matter what the charge or where the trial, the principle that the prosecution must prove the guilt of the prisoner is part of the common law … and no attempt to whittle it down can be entertained. … the presumption of innocence applies to all unconvicted persons. This is so whether they are unconvicted because the trial has not yet taken place or because a conviction has been quashed. The whole issue is brilliantly treated in Claire Hamilton‘s superb book The Presumption of Innocence in Irish Criminal Law. ‘Whittling the Golden Thread’ (Irish Academic Press, Dublin, 2007). However, at least in the context of convictions set aside on appeal, this was not an incontestable view of the law. 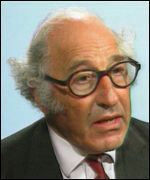 In 1997, Blom-Cooper, argued that the Court of Appeal got it wrong in the Hickey case, and that the presumption of innocence persists until a conviction, but once it is gone, it is not revived by the quashing of the conviction on appeal. Commentators disagree with judges all the time. Indeed, I have done so regularly on this blog. And Blom-Cooper is an outspoken commentator who regularly argues for alternative views of the law. However, in this case, he may have gone too far. He made this argument in a pamphlet called The Birmingham Six and Other Cases. Victims of Circumstances (Duckworth, 1997). 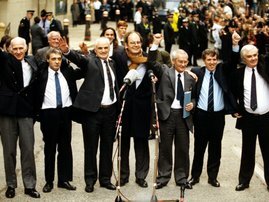 In it, he examined recent miscarriages of justice, such as the case of the Birmingham Six (pictured right), to raise once again his longstanding objections to the current system of trial by jury and to explore the consequences of the professional failure to explain the function of the Court of Appeal. Two of the Birmingham Six, Gerry Hunter and Hugh Callaghan, sued Blom-Cooper and his publisher, Duckworth, for defamation, alleging that various comments made by Blom-Cooper in the pamphlet constituted both an overt and a covert attack upon their innocence. [He argued that] the freedom to advocate an idea is a core guarantee of Articles 40.6.1. and 40.3.1. of the Constitution, … that the political function of free speech is of paramount importance in our constitutional democracy, … that the freedom of expression recognised by the Constitution must not be inhibited by a deterrent factor of the law of defamation and that if the inhibition goes too far it may undermine the constitutional right to freedom of expression, … [and] that the freedom of expression involving the advancement of knowledge in the ‘market place of ideas’ is essential in a democratic society. … I must rule against the defendant on the issue insofar as the same was formulated. Nevertheless, I am satisfied that the defendant has raised issues of particular importance on the trial of this issue, which have not been fully addressed previously. However, I believe that the issues raised on the trial of the issue before me are such that the defendant should be permitted to amend his defence in light of the ruling of this Court, with liberty to the plaintiff to plead to any such amended defence. I will hear counsel in relation to any time that may be required for such amended pleading. In other words, the Blom-Cooper lost on his claim that he had an absolute constitutional right or privilege to express his opinions. He appealed this issue to the Supreme Court; and – last Thursday – the Court dismissed the appeal, seemingly on the grounds that the constitutional issue could not arise until the facts of the case had been fully established. I will return to this if there is a written transcript of the decision. Given this conclusion, however, it means that other elements of Ó Caoimh J’s decision do not seem to have been considered. For example, to sweeten the pill for Blom-Cooper – in an aspect of his judgment which continues to confuse me – Ó Caoimh J held that, since he had considered important constitutional issues, Blom-Cooper could amend his pleadings to take account of the judgment. I remember that, at the time, this was regarded as either a score draw or even a moral victory for Blom-Cooper. However, it was unclear to me then, and is still unclear to me now, exactly how Blom-Cooper might take advantage of Ó Caoimh J’s concession. The essence of Micheal Ashe QC’s submission was that the common law should be refashioned in the light of constitutional norms; and Ó Caoimh J accepted that this would be so, but only if a conventional interpretation of the law of defamation did not satisfy the requirements of the Constitution. Ashe had relied on cases relating to qualified privilege in the US and elsewhere in the common law world to demonstrate how the law of defamation could be moulded to conform with constitutional principle, and to argue that they should be applied by analogy to support the different but parallel contention that the common law relating to opinion (rather than privilege) was inconsistent with the constitution. Bizarrely, Ó Caoimh J spent most of his judgment examining the substantive development of the law relating to qualified privilege, and even held that one of them – the decision of the House of Lords in Reynolds v Times Newspapers  2 AC 127,  UKHL 45 (28 October 1999) – was the most appropriate way of approaching the problems in the case before him. On the issue of qualified privilege, the High Court later came to a similar conclusion in a case in which the issue had properly arisen. insofar as the publication at issue in these proceedings largely comprises expressions of opinion, it appears that these can be addressed under the law as to fair comment, but that that law should be construed liberally to afford a proportionate right to freedom of expression of opinion, even when such expressions may give offence. So, it may be that he did appreciate that the constitutional reformulation of the common law in the qualified privilege cases was being relied upon by analogy, so that the flexible approach in those cases should be analogically applied to the context of fair comment. If so, then the revision of the pleadings which he was prepared to countenance was to accommodate this liberal defence of fair comment. Because Ashe had made the extreme argument that the plaintiffs’ claim necessarily failed simply because the pamphlet represented Blom-Cooper’s opinion, the rather less far-reaching point that the common law on fair comment might be re-evaluated in the light of the constitution was not pursued. This is a pity. But it may nevertheless still arise. Presumably, Ó Caoimh J’s concession of that the pleadings can be amended still applies. If so, then this is what Ashe should do on Blom-Cooper’s behalf. And if he does, then a further appeal to the Supreme Court may very well determine the extent of the impact which the constitution has upon the law of defamation. However, the Supreme Court’s dismissal of last week’s appeal on very narrow grounds means that neither Ashe’s very broad submission, nor Ó Caoimh J’s narrower concession, was addressed. The Court ducked these constitutional questions, and therefore did not make any change at all, let alone a fundamental one, to Irish defamation law. Thanks for the comment. I’m not sure it’s right, though. I can’t find anything like it in the Indian Constitution. Can you point me to the relevant provision?